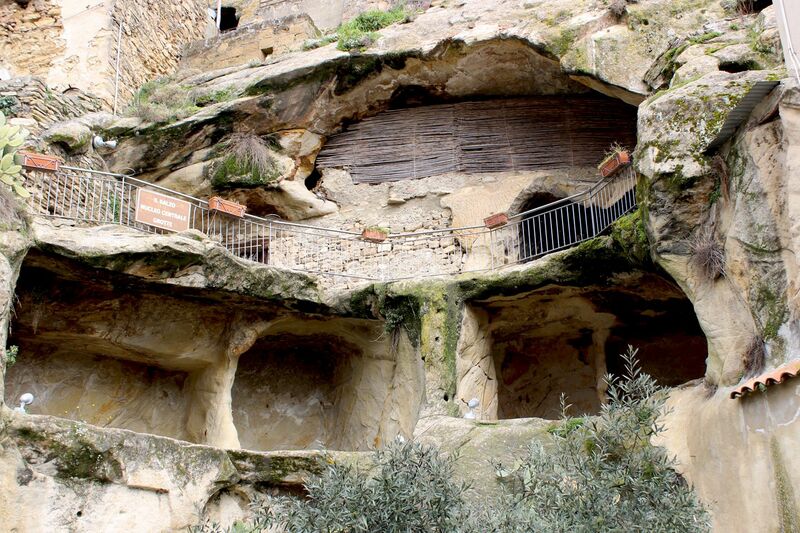 Sperlinga – a little town located some 45 km along dreadfully winding roads north of Enna is famous for its Castle in the Rock and equally spectacular Cave Village. 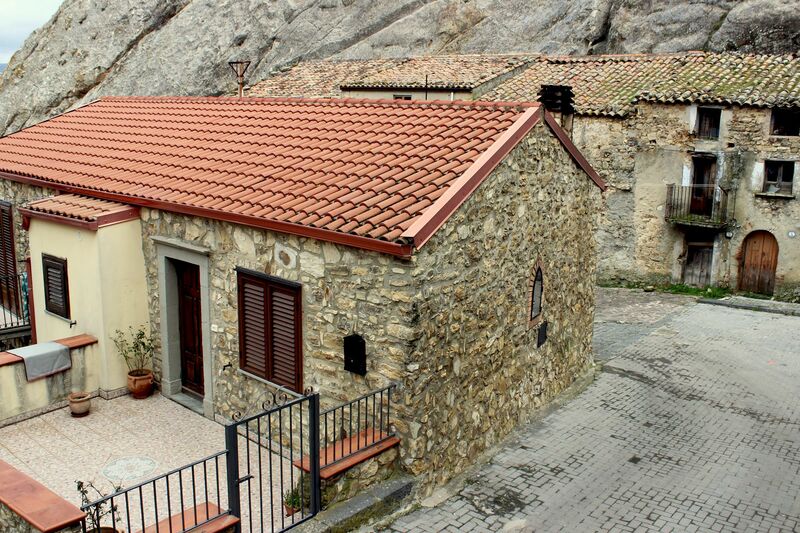 The town of Sperlinga is dominated by a huge rocky outcrop rising about 70 meters above the surrounding area. With its length of approximately 200 meters, width of no more than 10-20 meters and steep cliffs along its sides it resembles a gigantic fish’s fin. No wonder that since “always” the rock was attracting people for its allegedly magical powers, sacred nature and on more practical side - protection. Indeed, the relatively soft sandstone rock was a perfect material for digging caves serving as shelters for natives Sicans well back into the first millennium BC. The name Sperlinga itself is derived either from Greek (Spelaion) or Latin “Spelunca” – both meaning “cave” (13th century document of King Philip III mentions the castle under the name “Splingi”). 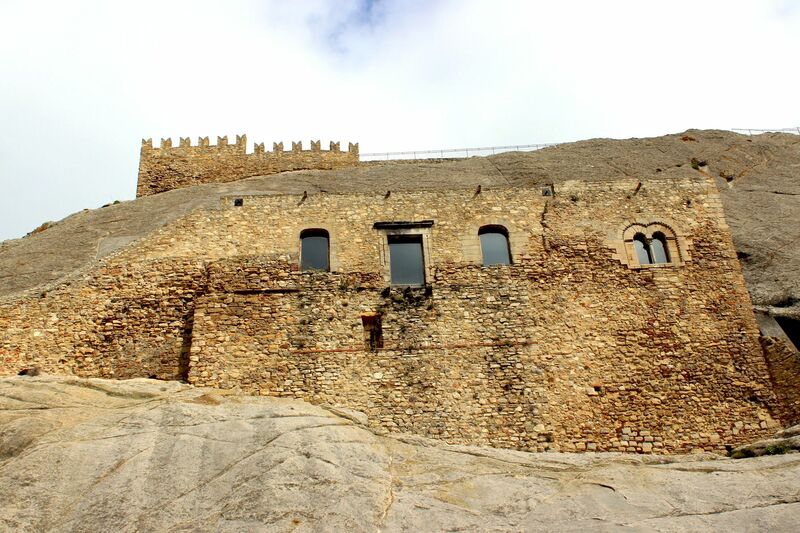 The history of the “Rock Castle” goes back into dark ages. For some - given its natural shape of an indestructible fortress, the castle has always been there. In “geological terms” “always” means since the emergence of Sicilian Island from the Underwater World – an event triggered by the breakup of the “Supercontinent” Pangea back in the Mesozoic era. Another (although still lacking evidence) story is that Sperlinga was an ancient settlement founded by native Sickels, known to Greeks as “Herbita”. While there are documents mentioning its existence, there is no any archeological evidence pointing to its real location. 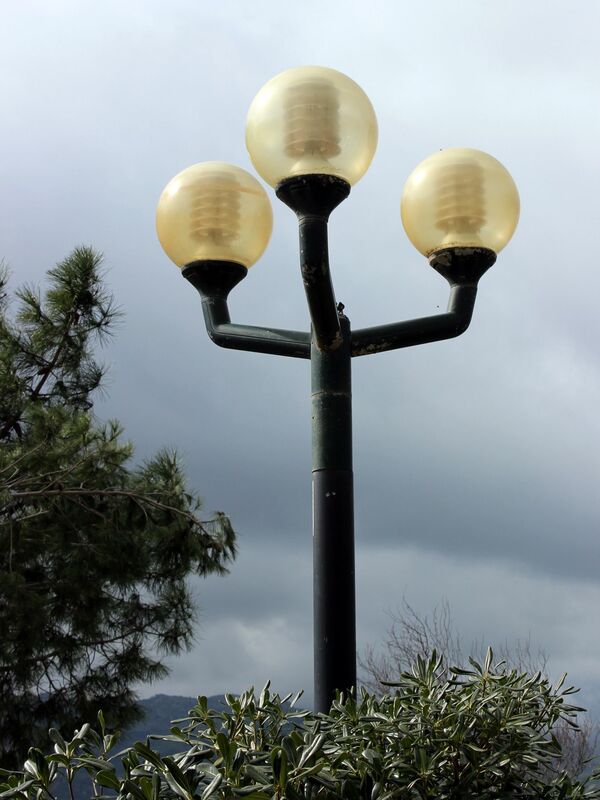 Historians speculate that this very ancient site could be located somewhere between Sperlinga and nearby Nicosia. For those more “down-to-ground” it all started during Byzantine times when most likely this massive rock was used as necropolis for Christians. But only at the end of 11th century with arrival of Normans, the Sperlinga Rock raised to its real potential. 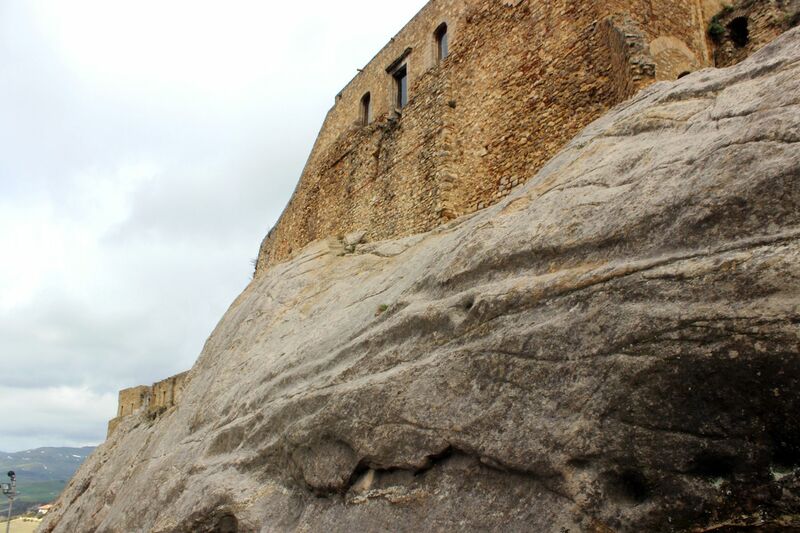 The works “adapting” this colossal rocky outcrop to the military needs started under the rules of Roger II and were continued by his successors. The castle was part of the much needed defensive system protecting a vital “Grain Basket of Sicily” (as the province of Enna was known). 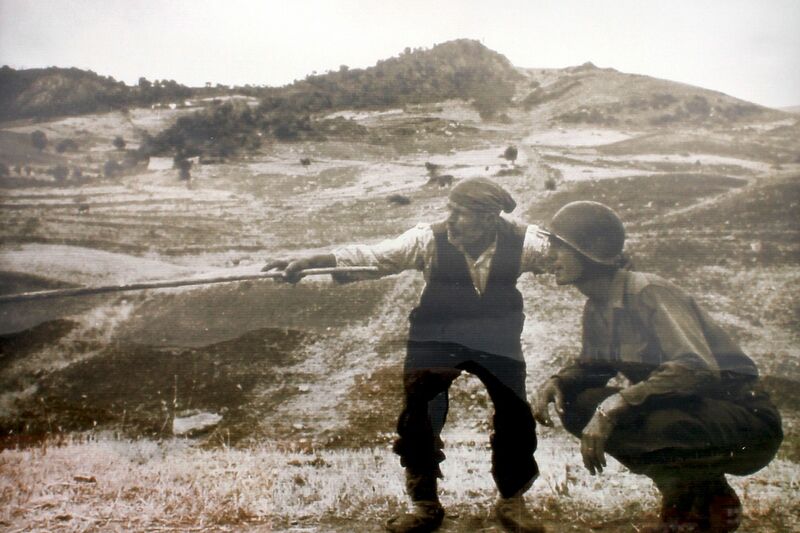 It was also securing an important land-connection between Palermo and eastern cities of Syracuse and Catania. Murky past does not clearly expose castle’s first rulers and owners. 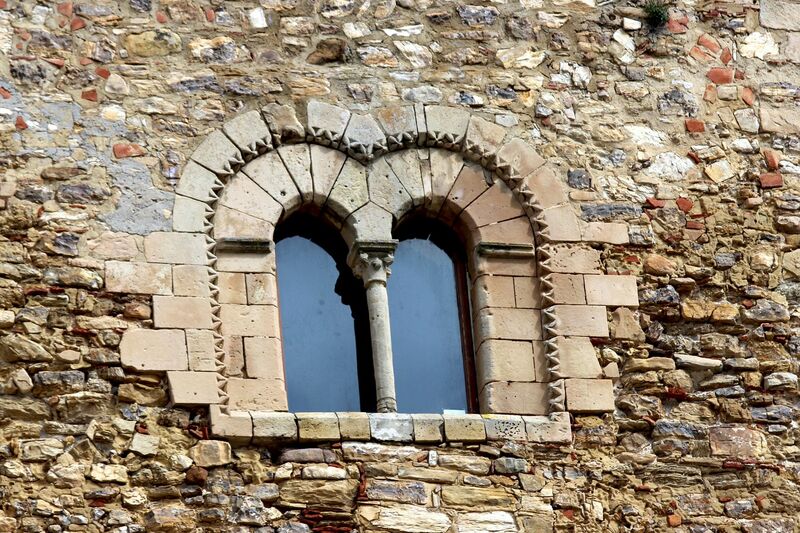 The first written evidence of the castle dates to 13th mentioning a prominent figure from Messina Russo Rubeo as the Lord of Sperlinga. 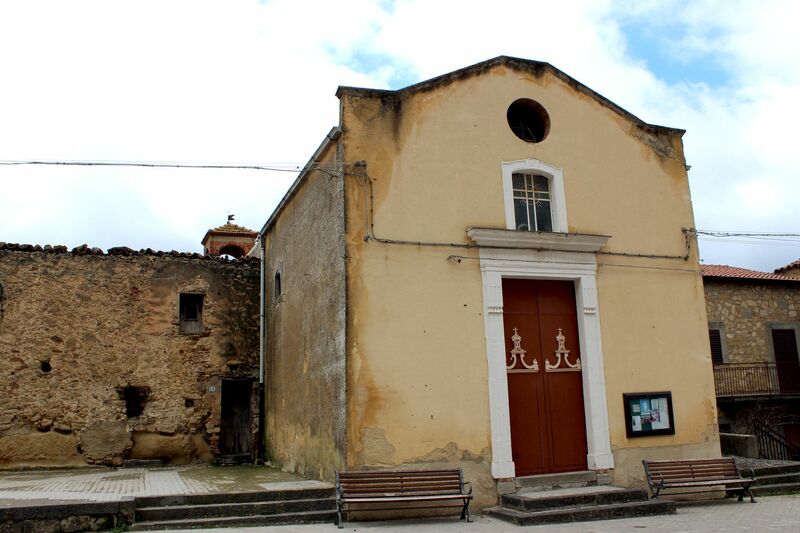 Clearer pictures emerge starting from 14th century - the time when the Castle of Sperlinga became the property of the powerful family of Ventimiglia (also lords of Cefalu, Sciacca and Termini Immerse among others…). In 1597 the castle was bought by a prince Gianforte Natoli who for the recognition of his services to the Crown also received king’s permission to build a feudal village near his new residence. 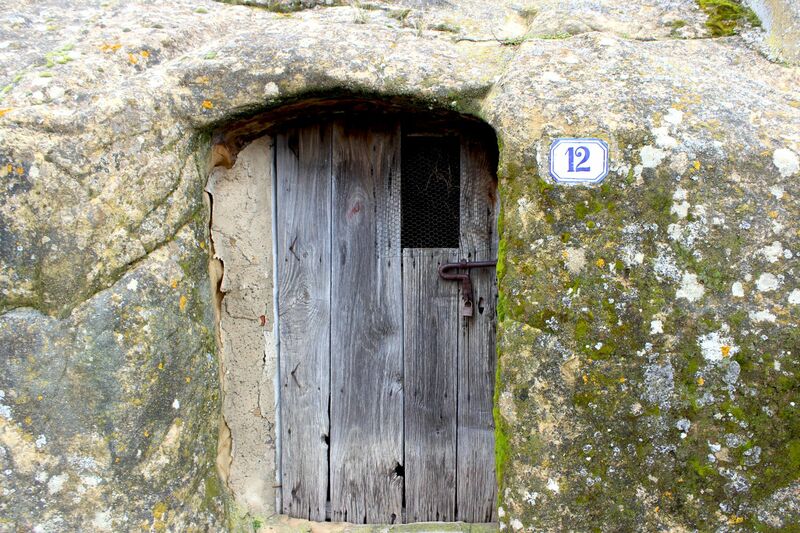 It was during his reign when the existing cluster of caves expanded not only “into the rock” but also emerged “out-of-the rock” in form of typical town with its narrow streets and stone-built dwellings. Prince Natoli was succeeded by Dukes Oneto – who since 1662 owned the castle for the next two centuries. 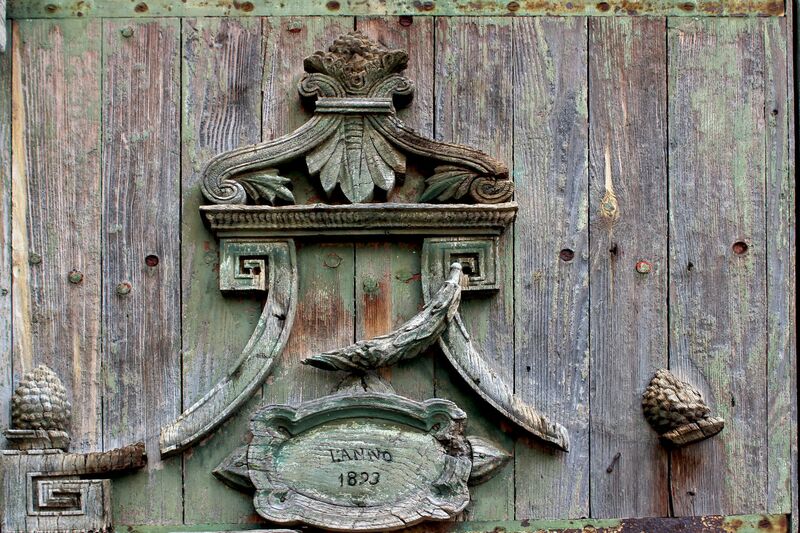 In 1862 the castle was handed to the family of Baron Nunzio Nicosia, whose heirs in 1973 donated it to the municipality of Sperlinga. 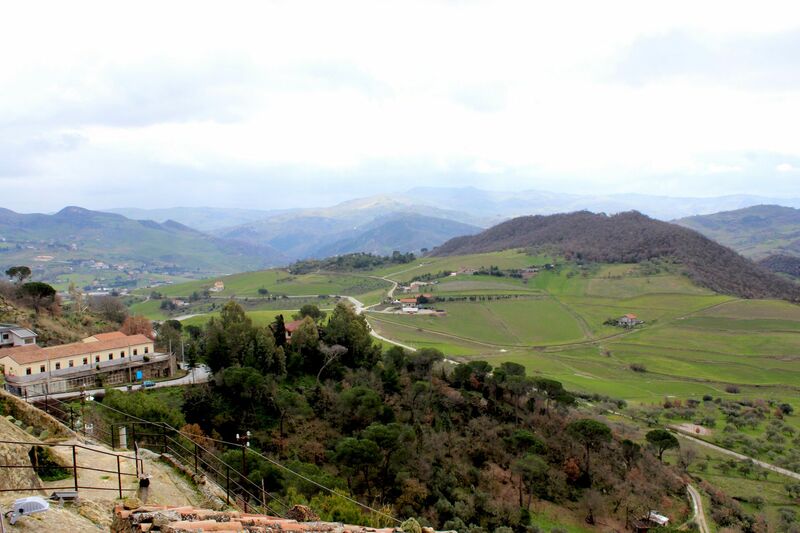 Since then, after extensive renovations the castle became one of the major tourist attractions in the Province of Enna. 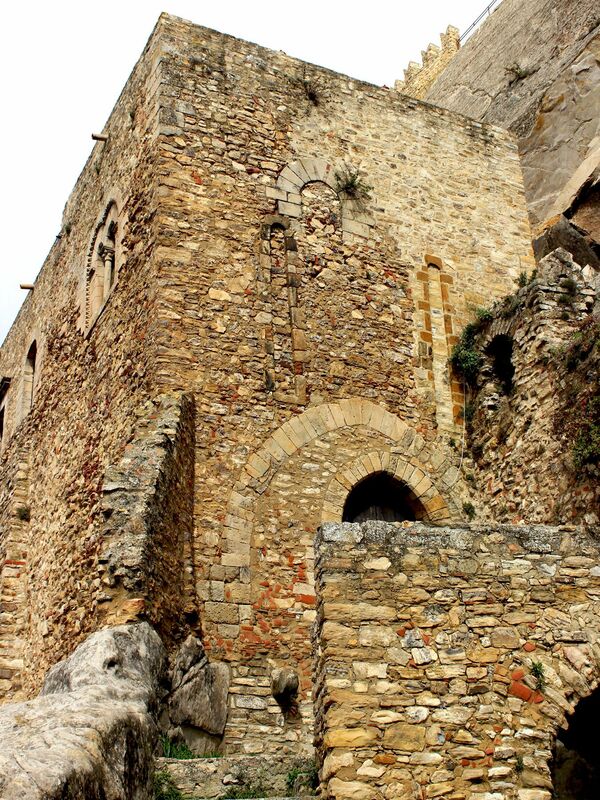 The castle gained widespread attention in 1282 at the outbreak of Sicilian Vespers War when it became the last-standing center of resistance of forces loyal to French king Charles I of Anjou. 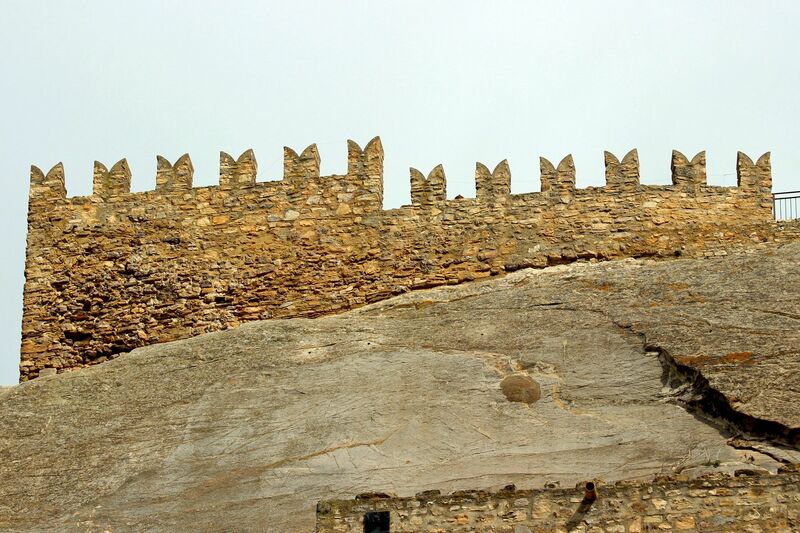 It took thirteen long months of siege by forces of Pedro of Aragon to conquer the Sterlinga Castle. The story (now overgrown by legends) is memorized by an inscription at the castle’ entrance gate stating: “Quo Sicluis Placuit sola Sperlinga Negavit” (Only Sperlinga denied what pleased Sicilians) making evidence of an overwhelming support of islanders for the dynasty of Spanish (Aragon) kings. But to tell the truth, Frenchmen put fierce resistance for good reason – an overwhelming majority of their countrymen was simply slaughtered during the War of Vespers. Sterlinga was the only chance to survive – or at least to prolong the time…. The castle Sperlinga is one of the most unique castles in Europe for most of it structure is hidden “under the rock”. Few visible “additions” surging from the giant sandstone rock including crowning it watchtower make it looking rather like a proverbial “Tip of an iceberg”. 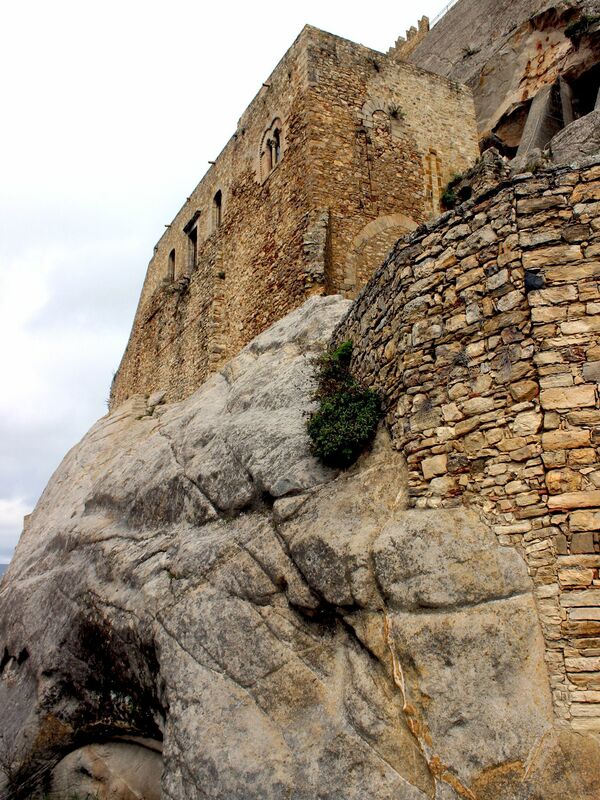 Due to the narrow shape of the outcrop the castle holds to it like to a saddle, hanging” on both of its sides. Main access through the succession of gates and vestibules. In the past it was protected by a drawbridge, now it is linked by a permanent stone-bridge. 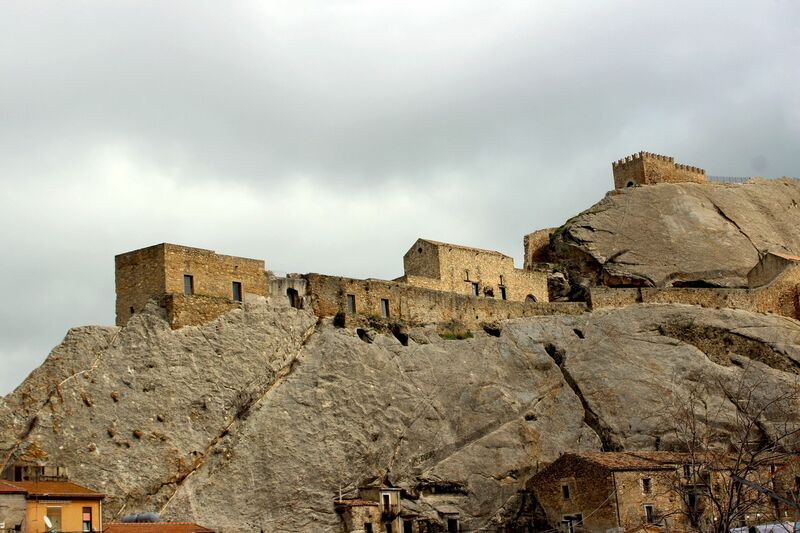 The castle extends several levels into the rock with stables, prisons, metal-workshops for production of weapons with remains of forges, stockrooms …. All of them like in a labyrinth of ants’ nest are connected by an extensive network of passages, corridors, balconies….. Most of them a well hidden inside of the rock, some exposed to the outside world by rows of large openings cutting through the rocky slopes. 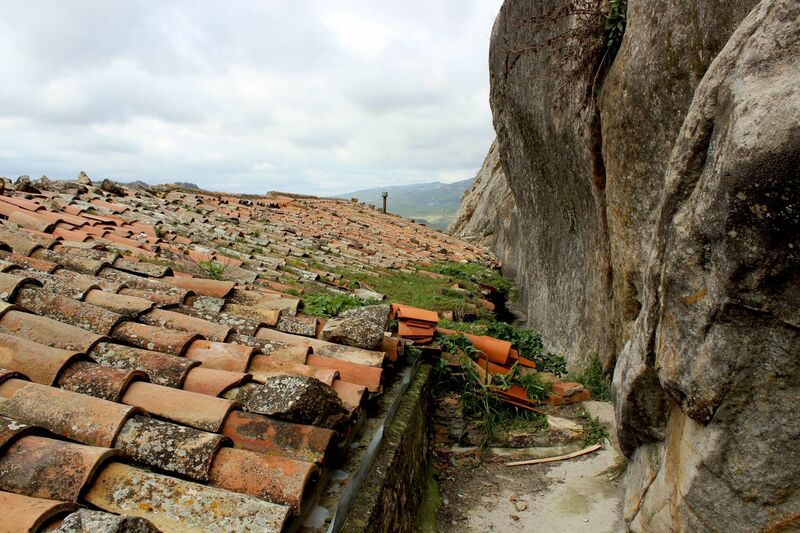 From there a famous flight of cut in the rock, weather-beaten but still impressive steps leads to the lookout tower. Once the tower rained deadly projectiles on those bold enough to try to capture the castle - now the tower offers spectacular views on surrounding areas. On the north the Nebrodi Mountains, on the east – the symbol of Sicily – Majestic Etna, to the east – Erei Mountains and the Madonie Range to the south. 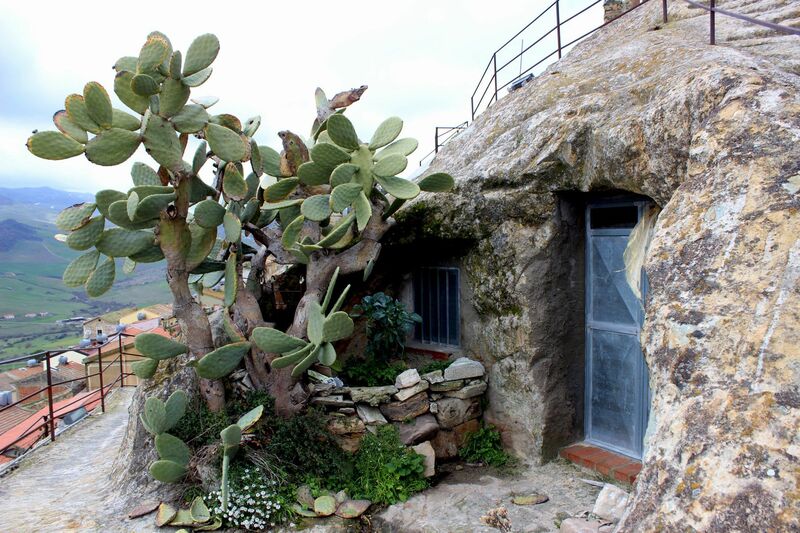 Although Enna claims to be at the geographical center of the island, Sperlinga, from its watchtower offers the true feeling of what it means to be located in the center of Sicily. No castle can survive for long without “supporting community” and Sterlinga was not an exception. Throughout centuries at the foothills of the gigantic sandstone rock grew a busy although “invisible” village. 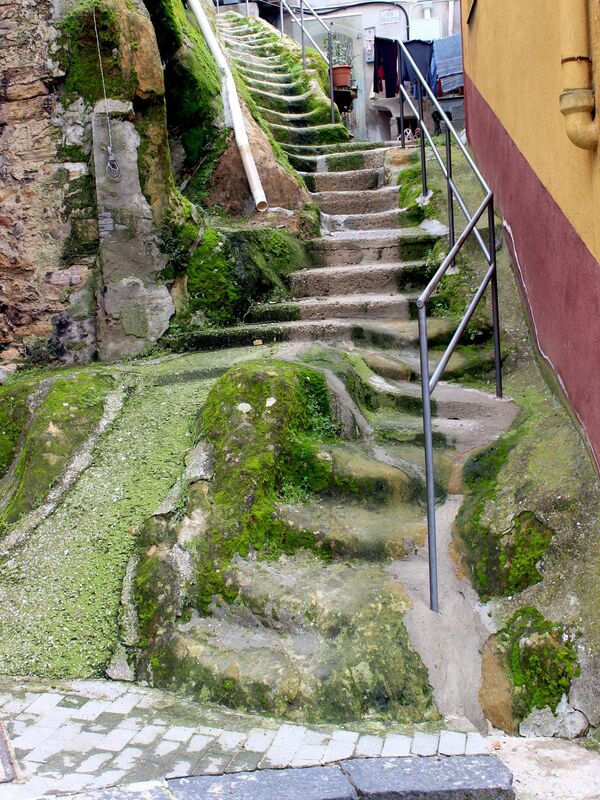 Hidden from the outside as an ants’ nest it consisted of numerous dwellings excavated in the rock connected by carved in the rock narrow, meandering passageways and flights of steps. 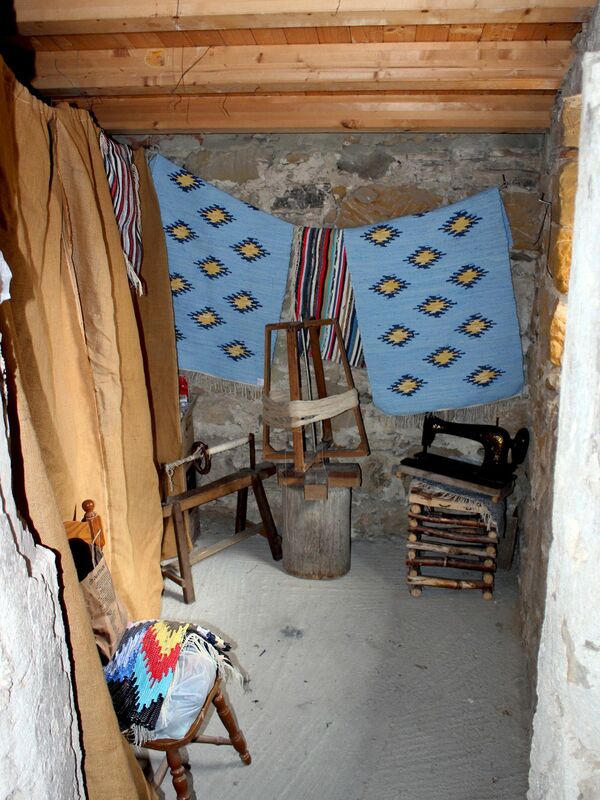 Most dwellings had quasi-rectangular shapes (about 2 to 3 meters per side) and consisted of two “rooms”. 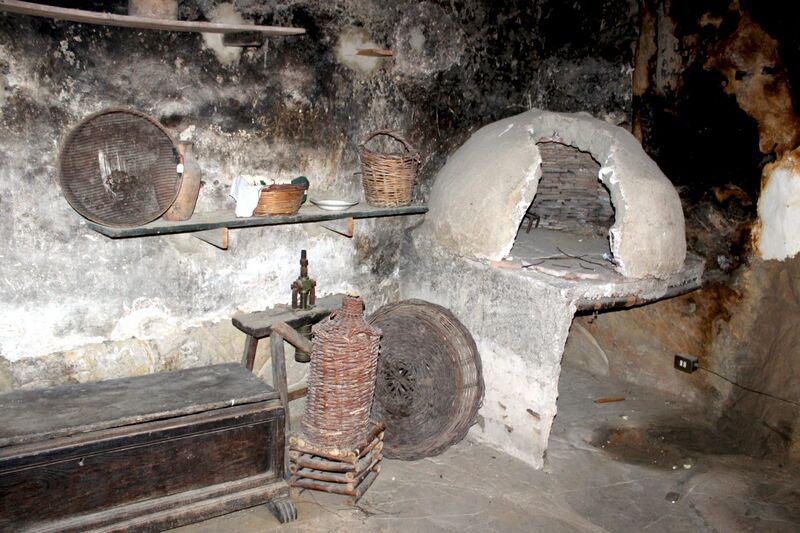 The first one – connecting to the outside world will have small window and usually housed an oven. The second room (if there was one) was dark. 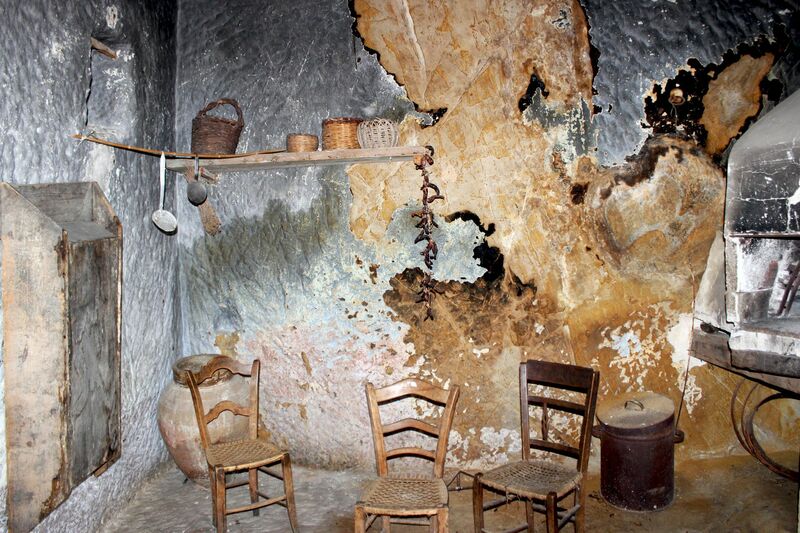 Most of these cave-dwellings were used until 1960s’. 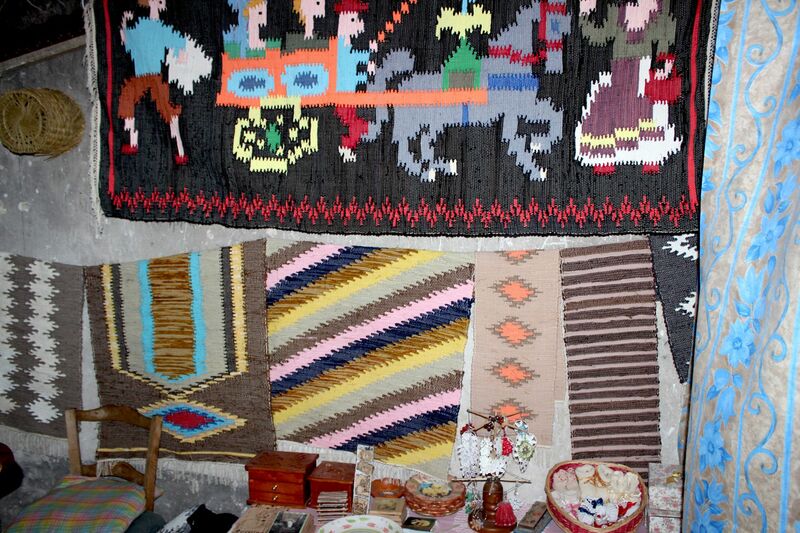 Since then these most primitive were gradually abandoned, some converted to storerooms and some purchased by the town and used as part of a “distributed” ethnographic museum. 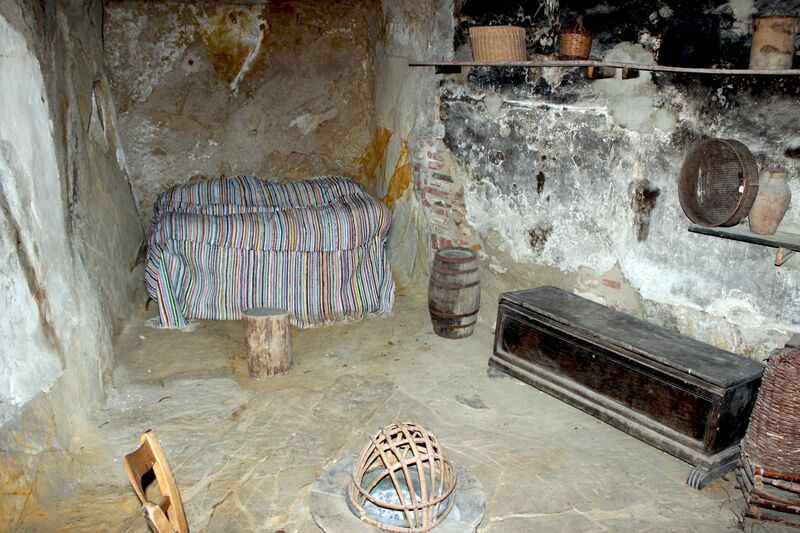 Equipped with baking oven or simply fireplace, basic furniture and rural tools they give testimony to lives of Sperlinga’s cave-dwellers….. 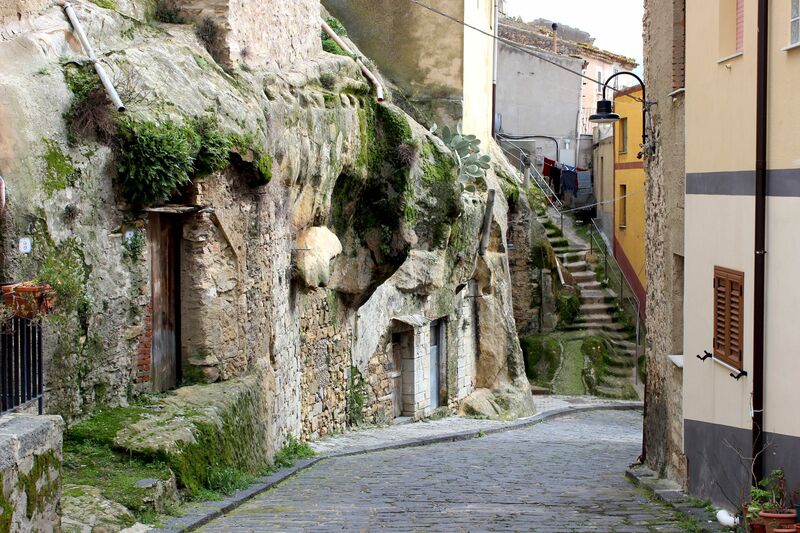 The best way to explore the Rock Village is by taking narrow path Via Cortile from Piazza Castello. It winds down along the rocky slope connecting numerous old cave-dwellings. In front of some there are remains of “little gardens” or at least whatever it used to be in the past, today usually invaded by weeds or burned by the sun. While Sterlinga’s “cave-men” since long disappeared from the town, their modern-day successors continue the old traditions. 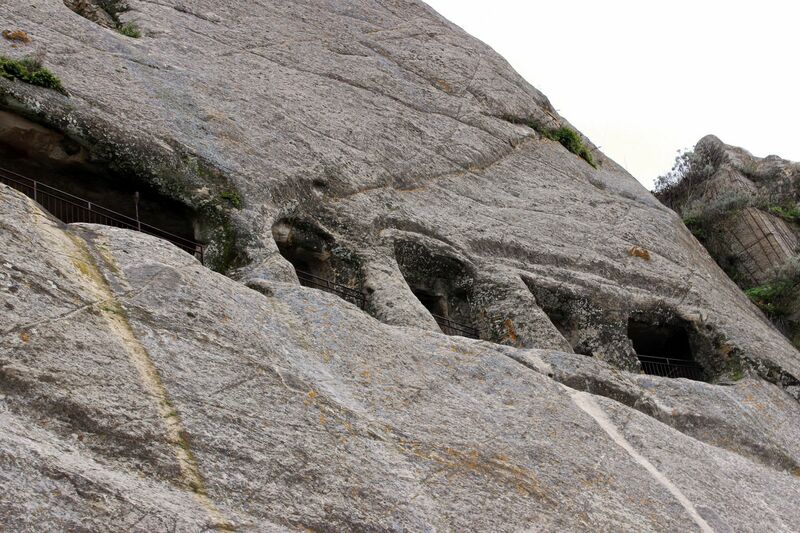 Modern facades literally “glued” to the cliff indicate existence of contemporary houses entirely carved in the rock. 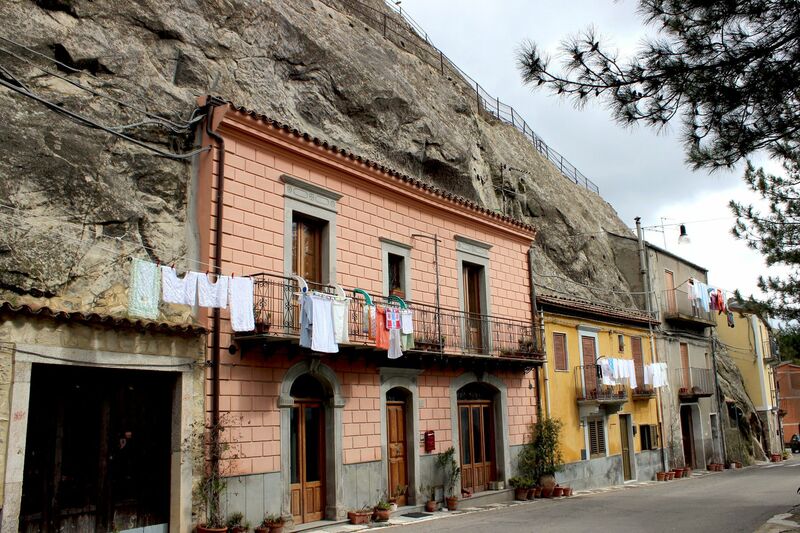 While these are not large multi-room mansions but rather modest houses, they have all required infrastructure to make them comfortable (including garages - obviously also carved in the rock). Their straight benefit is that the temperature inside is kept quasi-constant throughout the year (around 20-22 degC) so no need for heating or AC. The downside is also clear – only frontal rooms are exposed to the sunlight. Modernity in the "Rock Town"
“Sagra del Tortone” (Festivity of Tortone) – a celebration of local food including sweet cake “Tortone” and combined with a procession in historical costumes and election of a “Lady of the Castle”. The festivities were established in 1982 on the seventh centenary of the Vespers War and are held each year on August 16th.